Here is your guide to large and small loop antennas for transmitting and receiving. A comprehensive aid to understanding and building loops for longwave, medium wave, shortwave and VHF. Loop antennas can be very effective, even if you have limited space and a tight budget. Many diagrams and illustrations. 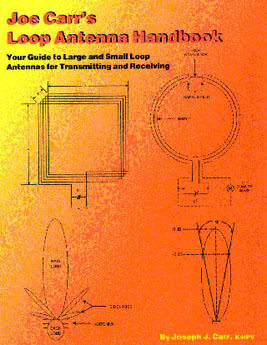 Chapters include: Loop Theory and Construction, Loop Projects, Quad Loop Beams, Small Loop Theory and Projects, Special Loops for Shortwave Bands, Loop stick Antennas, Radio Direction Finding, Small Loop Preamplifiers and Commercial Products. ©1999 133 pages. This book is reviewed in the February 2000 QST (page 77). Joe Carr was one of the most widely read electronics and communications writers in the world. He authored over 85 books and 650 articles on such topics as integrated circuits, radio frequency circuit design, biomedical electronics and radio repair and restoration. Copyright 1999-2017 Universal Radio, Inc.